I get so much email these days that it’s novel to get anything in the mailbox other than junk and bills (blech). So the other day, I was pretty excited to see my mother’s handwriting on an envelope for me*. I kinda figured it was a Christmas card, which was weird, because since when have I ever gotten a Christmas card from my mother? Instead, it was a page from a magazine with a handwritten note saying she’d seen something and thought of me, and then dropped it into the mail in a timely fashion so I’d have it just before the holidays. Which is why people invented mail in the first place, I’m pretty sure, because it all kinds of made my day. 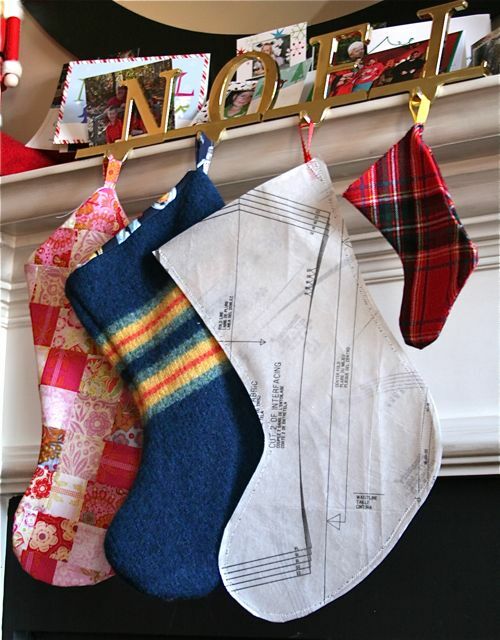 The page was from Country Living, and the photo was of sweet stockings made from vintage sewing patterns with iron-on vinyl on both sides and cut into a classic stocking shape. This one took all of 15 minutes–maybe–and is perfectly dashing on our mantle. My stocking from last year was pretty lackluster, so this is mine for Saturday, and will probably move to the shop after that. Get the template here to make your own (we even carry iron-on vinyl by the yard at Whipstitch, and will happily ship it out today!) and hang some sewing on your tree, dude! *Once, in college, I got a birthday card from my mother. My best friend (my best friend!) saw the handwriting on the front and said, “Dude, you sent yourself a card? That’s so sad, man.” Turns out our handwriting is eerily similar. But I really don’t think I’d ever send a card to myself. At least, not so far. ← Advent Calendar: Nearly There! Those are definitely on my list for next year’s shop decoration! They will go great with the dress pattern floor! LOVE love LOVE this!! I do belive I’ll make ma’self one! Thanks for the constant output of inspiration! Oh my goodness, LOL – on the college story. 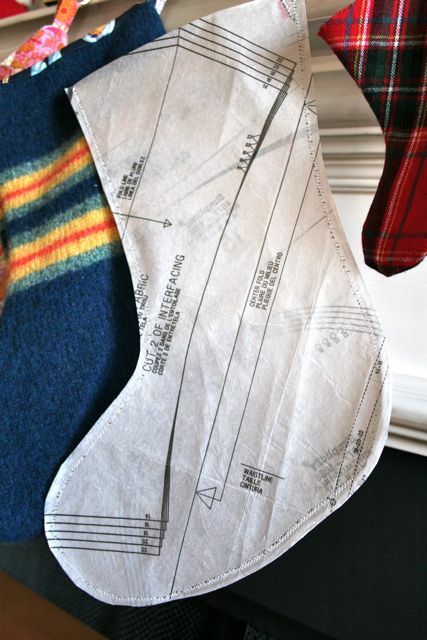 I LOVE the pattern stocking with a capital L! I now know what to make my Mom for Christmas next year! Although, I think she’ll need a few to decorate with! Iron on vinyl, awesome! What a great idea. Perfect! I’ll have to remember to pick up some of that vinyl – I hope to make it to the shop on Monday. Woot woot. Merry Christmas! Thanks for all the inspiration!